First and last third are so bad they’re good. The middle sinks into total boredom and deep sixes the whole thing. Too bad as they’re a lot of unintentional laughs. Redhead Irish McCalla is a blonde stuck with a dull cameraman and a wise cracking Chinese radioman. A hurricane knocks a boat off course onto a remote island. The trip was sponsored by a wealthy man who just happened to be looking for the island the boat washed up on. On board is his spoiled brat daughter Jerrie (Iriah McCalla), cameraman Fred Maklin (Tod Griffin), boatman Kris (Charles Opunui) and radioman Sammy Ching (Victor Sen Yung). Navy bombers fly over and Sammy hears on the radio how the island is going to be used for bomb practice. Since it’s an uninhabited island they find footprints. That night they hear jungle drums. Jerrie,Fred and Sammy go exploring, get lost and then return to camp. The place is wrecked and Kris is a goner. Washed ashore is the body of what they refer to as a she demon. The drums are back and the trio goes to take a look. Who do they run into? The Diane Nellis Dancers. They also double as she demons. While still looking foxy they do a dance number. Who comes along to spoil the fun? Nazis. A cage full of disfigured women is discovered and then they can’t help but notice a cave, Fred doesn’t find anything. Inside is the mad doctor Colonel Karl Osler (Rudolph Anders). He’s trying to find a way to fix his wife Mona’s face. His experiments cause the girls to turn into demons. They’ll be okay in a few days only to be experimented on again. Eventually our heroes get captured and there’s a long explanation from the Colonel about how he’s using the heat from lava to invent perpetual motion machinery. Too bad Mona got to close to the lava and now her face is covered in bandages. Osler keeps trying to lay the charm on Jerrie but she’s not falling for it. Ol’ boring Fred and wise cracking Sammy try for a rescue and end up being locked up. Looks like it’s Jerrie’s turn to be a she demon. Some editing in the bloated middle of this thing would have been a big help. Irish McCalla was TV’s “Sheena:Queen Of The Jungle” (1955-56). Among his many TV and movie appearances Victor Sen Yung was best known as Hop Sing on “Bonanza” (1959-73). 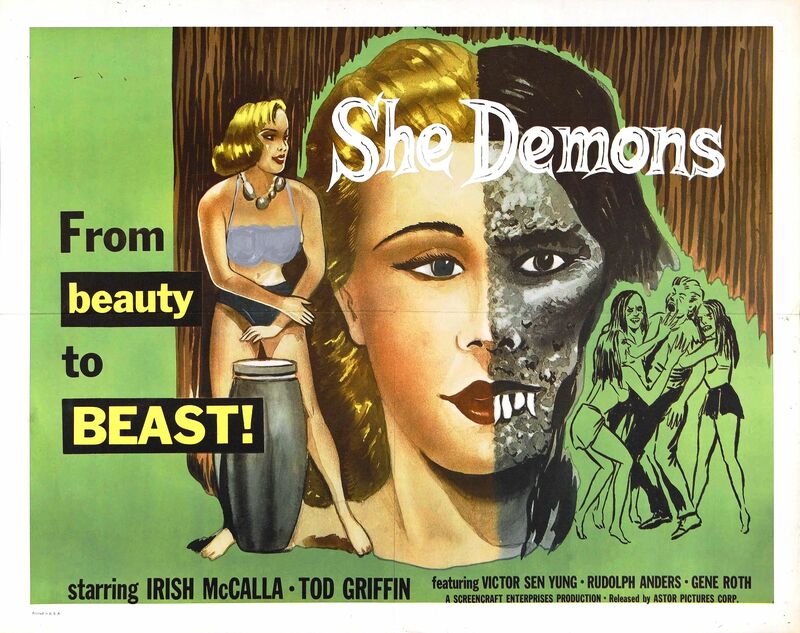 This entry was posted in Horror, vintage movies and tagged Movies. Bookmark the permalink.